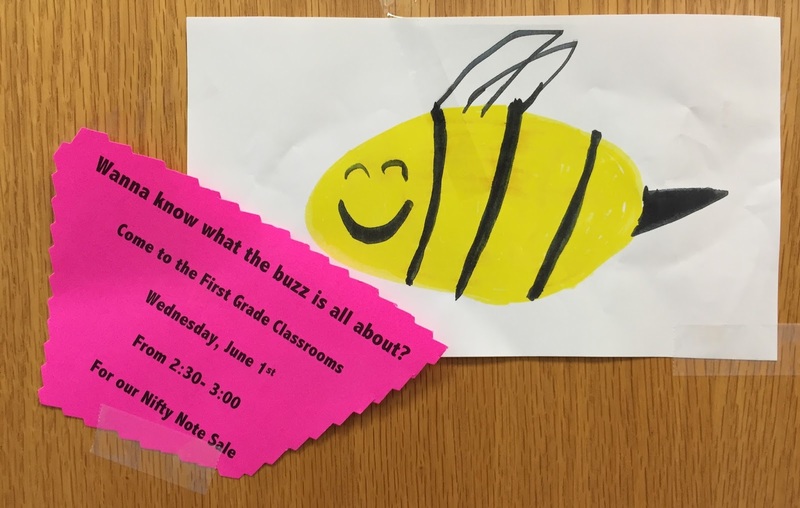 Our Nifty Notes first grade entrepreneur project is in its fifth year, and so is our push to educate the young learners about media literacy. This collaborative project brings together their study of economics, including wants and needs, supply and demand, and scarcity and abundance, with an understanding of the art of persuasion, marketing, and hype. 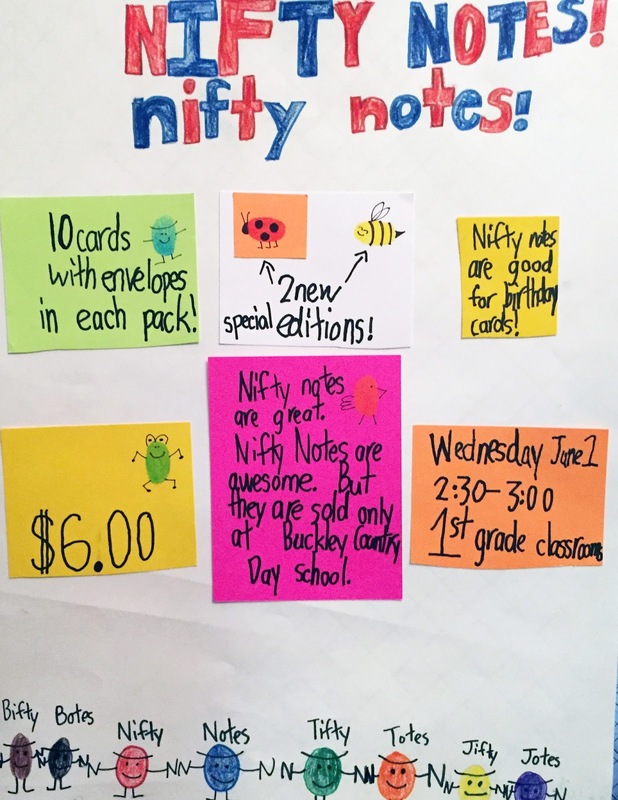 This year the goal to produce 1500 Nifty Notes was ambitious, but the first graders stepped up to the challenge, because they understood that they were raising money for charity. It was extraordinary to watch them during their library classes grasp how marketing techniques help sell products. The media influence is so pervasive that they easily adapted commercial slogans and jingles to their product. They looked at contemporary media messages and discussed how phrases such as "limited editions," "one-of-a-kind," and "handmade" help persuade consumers to buy products. 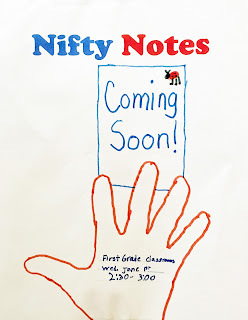 Their ideas were so electric that they started generating their own teaser advertising techniques to sell Nifty Notes. 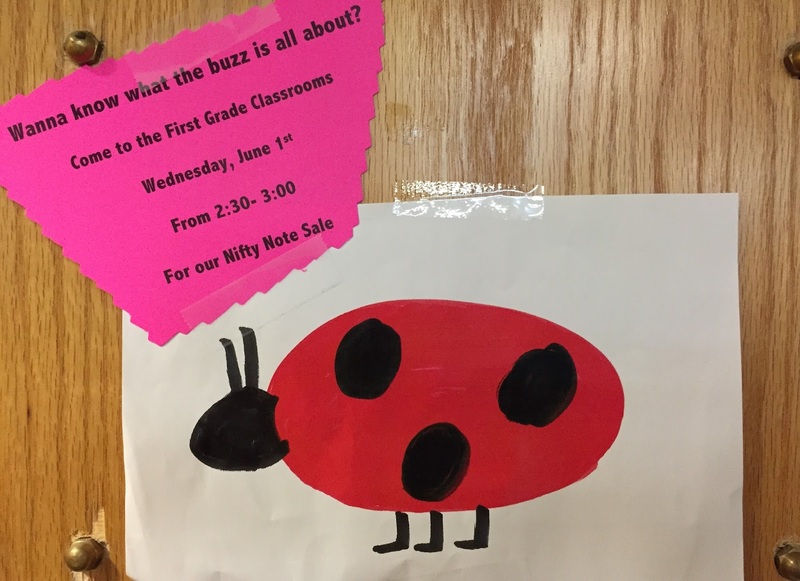 One student came up with the idea just to put images around the school of the ladybug and bumblebee, the two new designs for 2016. A few of days later, they added hot pink notes that began with, “Wanna know what the buzz is all about?” It goes to show how when educators empowered learners, they take ownership of their ideas. It also demonstrates just how much they see in the media. 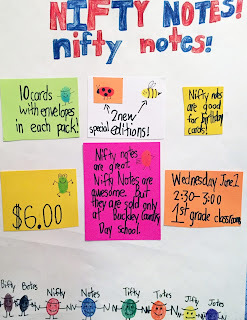 Their promotion of the Nifty Notes sale did not stop there. 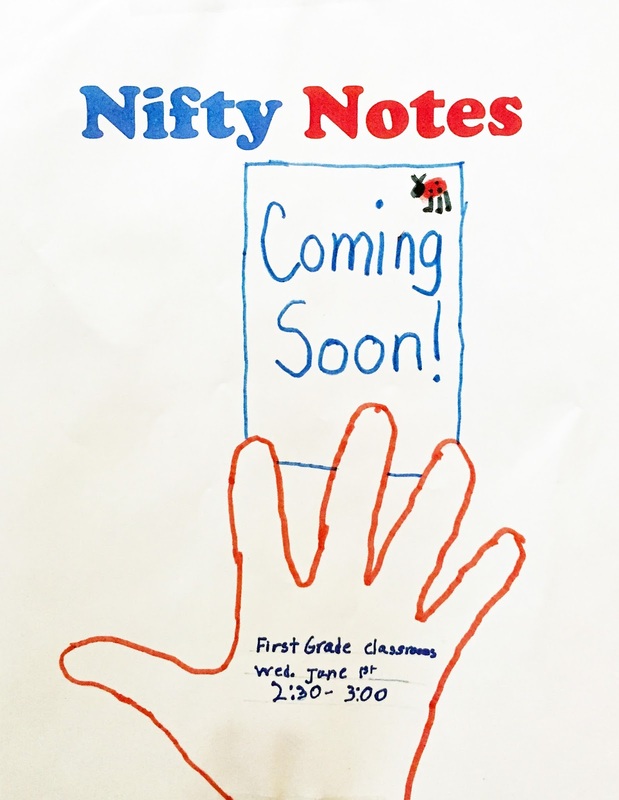 Another first grader designed fliers advertising, “Nifty Notes Coming Soon.” We can only imagine what this Tuesday will bring to help promote the sale. These first grade entrepreneurs got the point, big time! Born Digitals Love To Make Things – Vintage Matters! 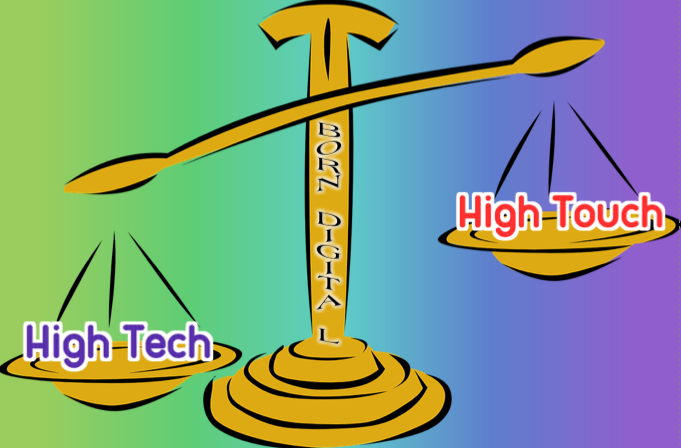 Born digitals deftly use technology; for them, it just is. Yet we constantly see discussions, blog posts, and articles about where and whether we should integrate technology, how it should be done, does it motivate learners, etc. We are decades past this discussion. Of course technology feeds motivation. What else would — filling in worksheets, taking linear notes, or sitting through text-laden PowerPoint presentations? 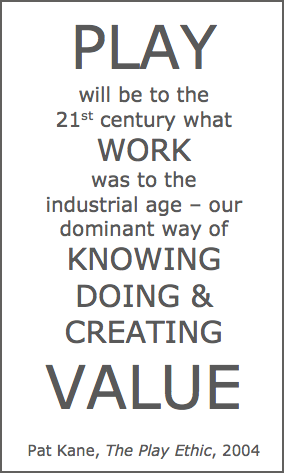 Education seems to view technology as something separate. It’s not for us, nor is it for our students. We use our devices all the time, and so do they. In fact, they approach technology fearlessly and can find workarounds with little trouble. Internet down? No problem. They set up hot spots using their phones to work on their iPads. Looking for contact information? No problem. They conduct a Google image search to connect to a LinkedIn profile. Need to send a direct message? No problem. They do it through social media. We've witnessed all of these scenarios with our middle schoolers. 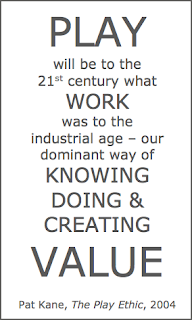 So why do we now see a surge in kids regarding making things with their hands as so exciting? Simple. They rarely enjoy opportunities to do this type of work anymore in most classrooms across the country. Few students experience “free play.” They live in a play date world of scheduled activities and rarely take risks without a helmet and harness. Physically designing, building, prototyping, and testing things they construct is the novelty, not the technology. Most of them have grown up using tech since infancy. It’s a no-brainer to search to find information or watch a YouTube video for ideas, tutorials, and entertainment. But to actually make something is the memorable part. It’s what John Spencer describes in his video entitled "Kids Need Vintage Tools." Vintage does not mean old; instead, it refers to something of high quality and lasting value about a particular object from the past. We see the lasting value in balancing high tech with high touch in our curricula, and we make room every chance we can to incorporate it. This includes hand-drawing maps, constructing early farming settlements outside, or planning community villages. Our students may use technology in the process to document their work, but what they remember most is making it. They use vintage tools all right, including pencils, paint, and glue. They love it. So while we applaud, integrate, and depend on technology using any device, in the end what we find is using tactile materials changes the way students feel about their creations. We don’t slight tech at all; in fact, we love it. We would argue that today's heightened interest in robotics is not in using the technology to program, but instead in actually watching the robots come alive. This applies to creating stop-motion movies, designing apps, and creating computer games. Each of these endeavors turns out a product in the end. The process in making any one of these, however, is the addictive part and the one that is most remembered. Making matters. 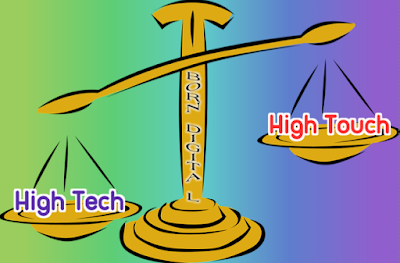 Our high tech born digitals may just thrive on high touch even more! Most famous maps capture a snapshot in time. Mercator’s Projection, Blaue’s Atlas Maior, John Smith’s Virginia — they all signal the cartography of an era. These geographies trumpet discovery and location. They welcome ornamentation. But they do not invite interaction. And they never change. The blessings of technology today mean that maps now breathe in constant updates. The ability to track global changes and inform visual displays in real-time turns children and adults into earth monitors. 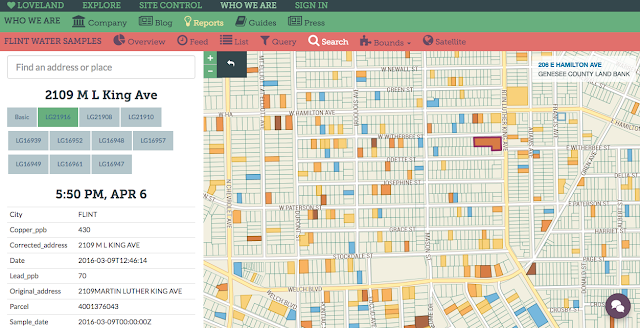 Interactive geography provides unprecedented access to world data streams, such that humanitarian and ecological crises can be pinpointed in exact, colorful, dynamic degree. The following resources have been painstakingly and brilliantly assembled by dedicated activists and educators. Each visual tool allows teachers, students, and viewers to explore past, present, and future conditions based on a host of critical criteria. 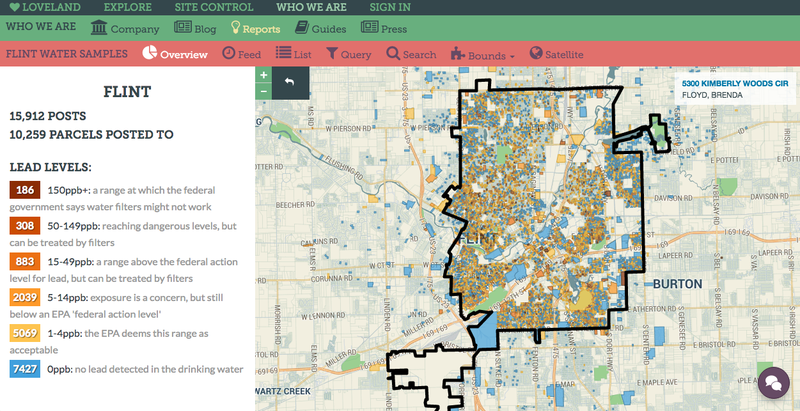 The Flint Water Map, by Loveland Technologies, provides a searchable database of 6000 residential lead samples from this hard-hit Michigan town. The relevant, valuable interface combines a color-coded visual field with a detailed, house-by-house catalog of lead testing results. The tool is easy to use for both Flint residents and interested students who are concerned about the state of localized health. 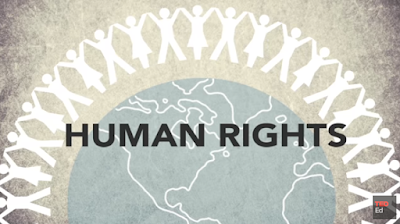 It is a model of geographic action for public purpose. 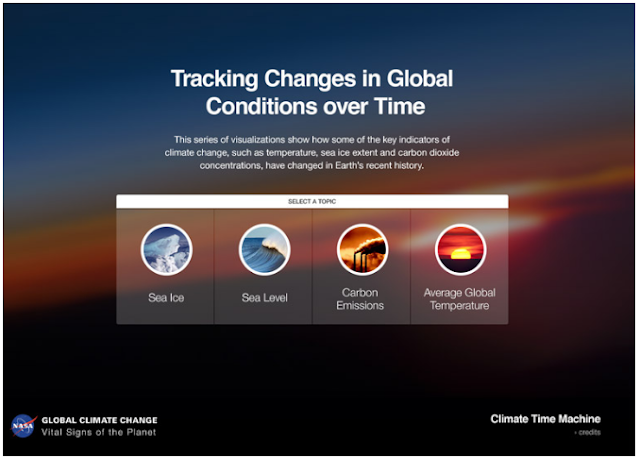 National Geographic has once again produced a stellar interactive about history and geography. This scrolling motion graphic traces the idiosyncrasies of California's water supply. It pinpoints the causes of the state's current drought, and it highlights the importance of groundwater, snowmelt, reserves, and cultivation in managing the pipeline to the people. The highly customizable map by Global Forest Watch melds multiple data sources into one terrifically educational (and at times terrifying) survey of tree cover, land use, conservation, and population. The options are too many to list here, but they include Google Earth resolutions, specific country statistics, timeline progressions, and zoomable analyses. This is a great first landing site for teachers and students interested in displaying how the world's forests are changing over time. 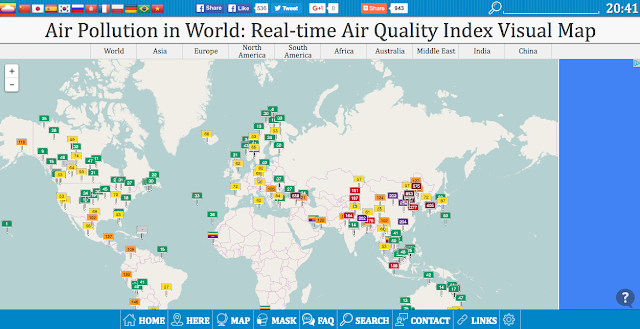 This index by World Air Quality employs an understated map of colored tags to let data be the star. 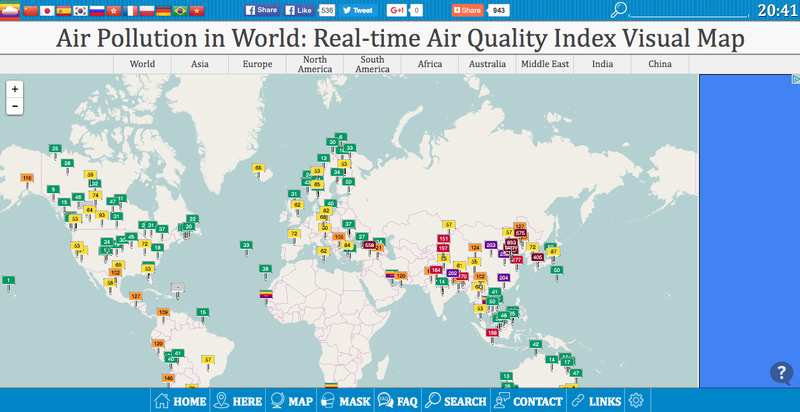 Every flag reveals vital statistics for a global locale: the air quality index (AQI), air pollution level, health risks, and cautionary statements. Together, these figures furnish a revealing look at how atmospheric pollution can have concrete effects on the well-being of cities and citizens. "The Human Fingerprints On Coastal Floods," by Climate Central, is a compelling article that includes a clear interactive graphic about the flooding of American cities. 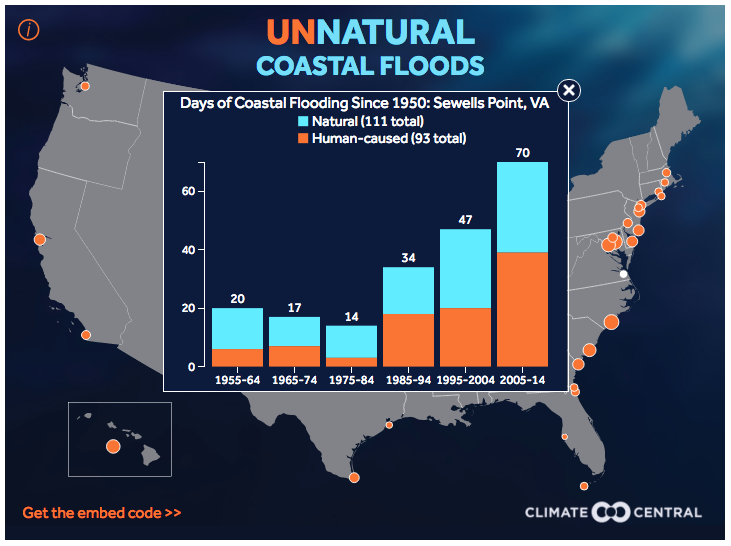 The clickable map projects graphs of year-over-year increases in sea levels. For example, since 1950, parts of the Chesapeake Bay have seen water levels rise by a foot, directly due to human influence. The Climate Time Machine from NASA is beguilingly simple at first glance. Upon deeper digging, though, the different interactives prove their complexity. The high-octane maps reveal historic transformations in sea ice, water levels, carbon emissions, and global temperatures. The site is a data gold mine of evidence to rebut those who claim that climate change is just unproven fear-mongering, rather than an immediate cause for concerted global action. 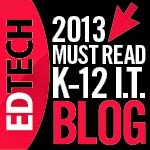 The use of videos in learning is no longer exceptional. Whether via classroom viewing, flipped instruction, or self-directed YouTube searches, kids expect a multimedia accompaniment to their otherwise humdrum lectures and daily note-taking. Having students create their own videos upgrades the internalization of ideas to a much more nuanced level. Inviting learners to produce their own content is the difference between input and output, content and skills, decoding and encoding, passivity and activity. Luckily, an array of user-friendly (and largely free) websites and apps has made it easy to incorporate video projects into any humanities or scientific classroom. For example, we’ve written before about how much we like Adobe Voice and Renderforest in giving students agency over their own learning. 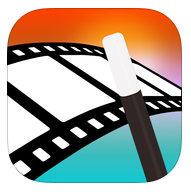 One of our favorite (and effortless) apps for creating videos is Magisto. Intended as an automatic editor, Magisto’s algorithm self-selects the best parts of your video clips and images, and it splices them together into a stunning finished product. Even using only still photos, the app does a magnificent job of melding photographs into a powerful short film. Yes, there are free and paid options, but the free version offers a nice buffet of styles and songs to allow for customization. In addition, setting up student accounts is a breeze, with no concerns for firewalls or emails. In our history classroom, we’ve used Magisto to particularly worthwhile effect in studying primary sources. 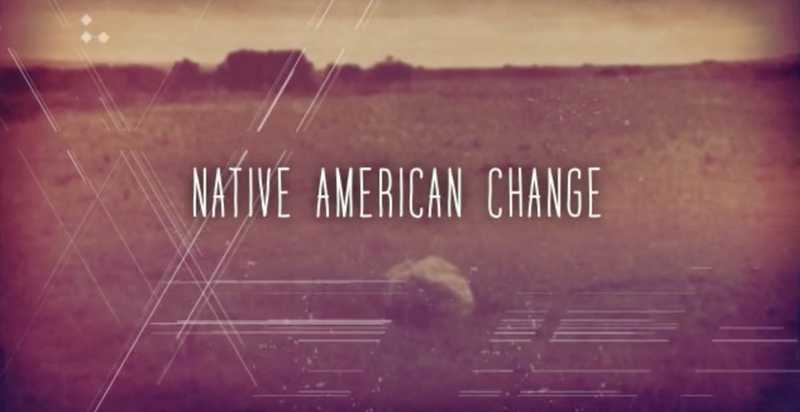 For example, in our investigation of assimilation and the Dawes Act in the American West, our eighth-graders examined the photographs of Edward S. Curtis in his documentation of Native Americans. Among historians, Curtis owns a difficult legacy. On one hand, he was the only Easterner who committed years of his life to record and preserve the vanishing tribes of the continent’s First Peoples. On the other hand, he posed his subjects in deliberately disingenuous headdresses, choreographed untimely rituals, and removed contemporary technologies from the photographs he thought should speak only to yesteryear. Whether “true” or not, Curtis’ choices invite valuable conversations about historiography and ethnography. In the end, all photographs involve making choices. They are, therefore, by nature artificial. Every kid who frames and retouches an Instagram snapshot knows this. All primary sources, in this mold, are less-than perfect, because they all emerge from the lens of their creator. But does that detract from their value as illuminating historical relics? Or put differently: the lesson here is for students of history to be rightfully skeptical, while still appreciating the value of evidence. Selection - which images would properly relate to their theme? Sequence - what progression would make sense from start to finish? Style - what editing suite would complement the intended mood? Music - what instrumentation would add value to the theme? Text - what title and summary would help teach others? Tone - what overall feeling or motif would wed the images together? The father of data visualization, Edward Tufte, likes to say that 1 + 1 = 3. He refers primarily to white space and spatial adjacency. But another corollary suggests that when combined, two visual elements create a third sense of meaning simply because of their union. The marriage of two parts establishes a separate sensibility via their juxtaposition. Nowhere is this more true than in producing videos. The images, text, editing, soundtrack, transitions, and effects all fuse together to give birth to a wholly original animal that is more than the sum of its parts. When kids design their own films, they become the educators of their peers. They must stitch together a narrative and storyboard each moment in a process that combines logical reasoning, cause-and-effect, and content mastery. 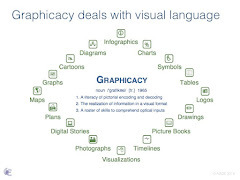 They also must employ their graphicacy skills to fashion compelling and appealing visual displays. On a most basic level, students also genuinely like making movies. 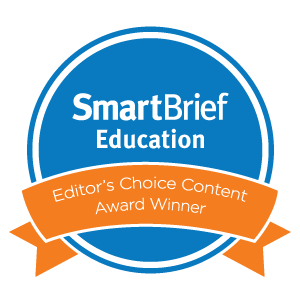 It’s a low-cost, high-reward project that gets them excited to dive into primary sources and eager to engage with the material.